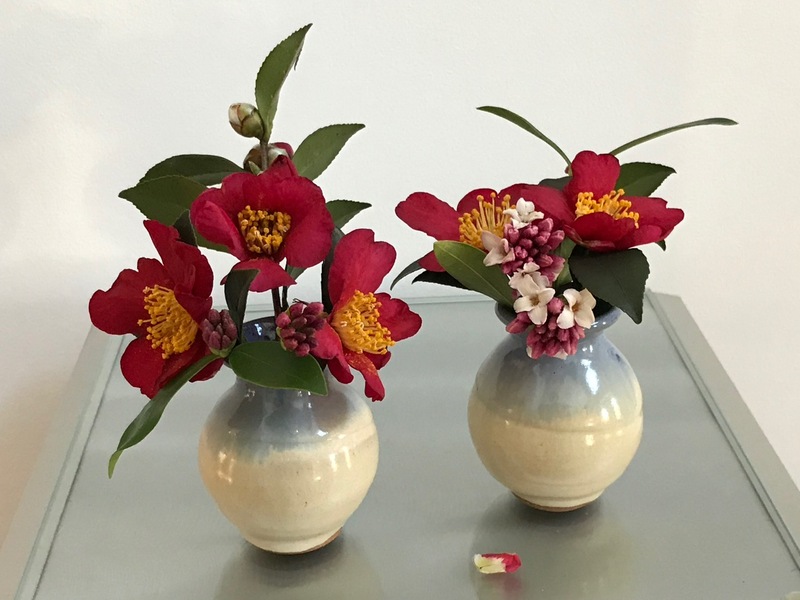 A few blooms gathered Sunday afternoon went into one of my favorite Ikebana vases. 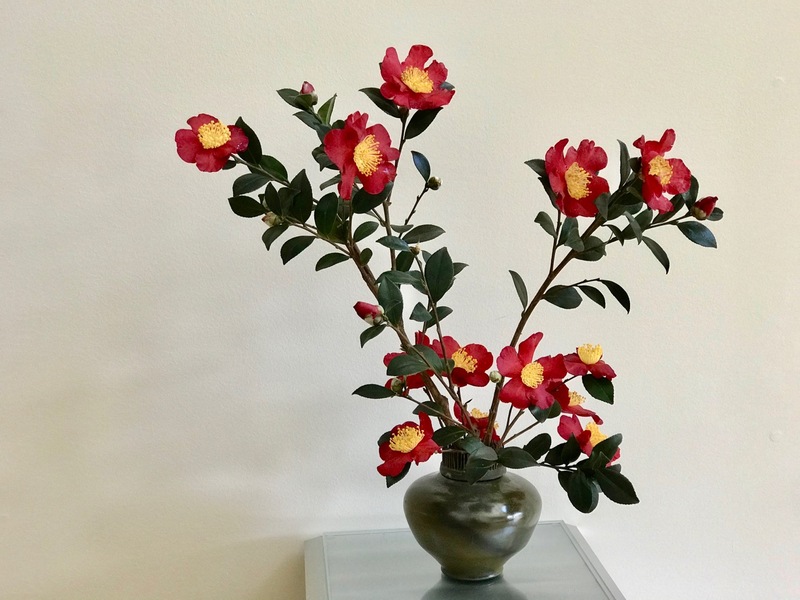 Included in the Ikebana arrangement is a Camellia sasanqua ‘Yuletide.’ The red Yuletide camellia opened in late October (as I recall) or at least by November 8, 2018, and despite the recent cold snap it continues to offer a few flowers. 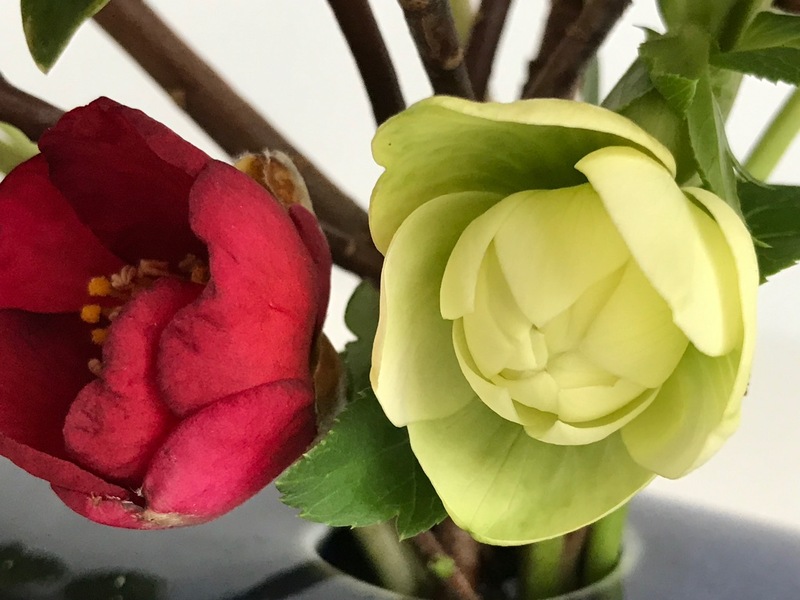 The small size of the camellia made it perfect for pairing with the creamy double-form hybrid hellebore purchased several years ago at Pine Knot Farms near Clarksville, Virginia. 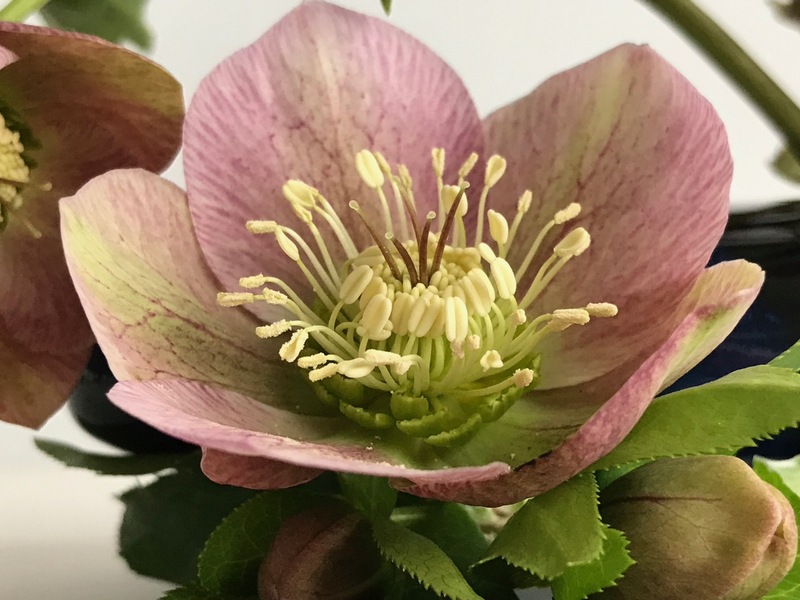 It is just scrumptious. 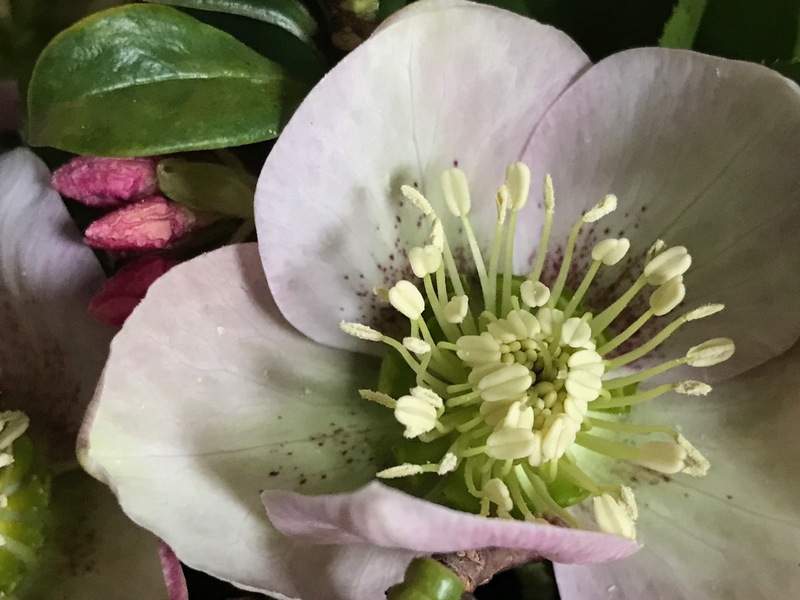 Hellebores opened in my garden in January, 2019, a little later than in some years. 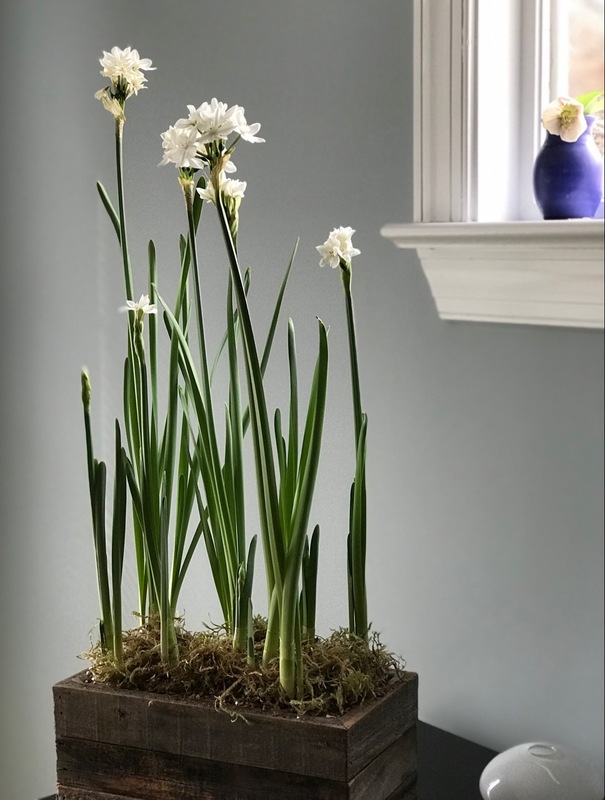 They usually bloom well into April. 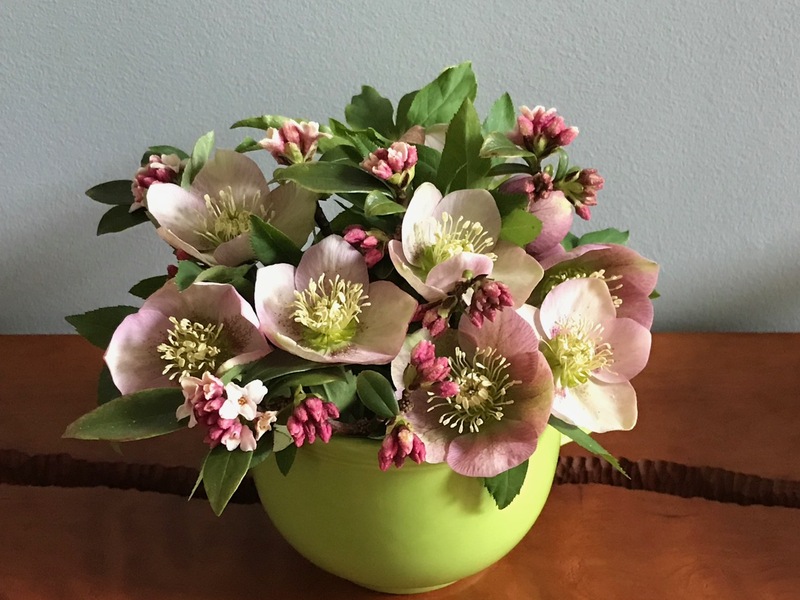 Some of the hellebores have been in the garden since 2001. 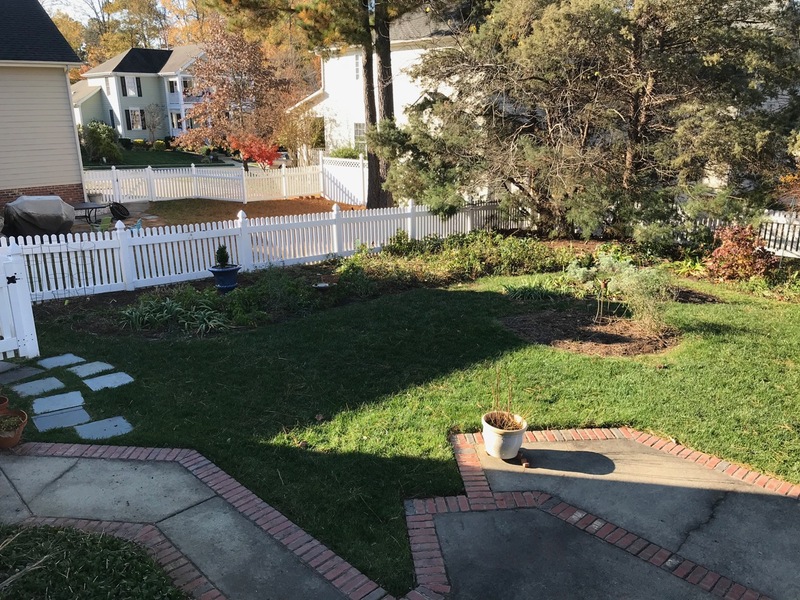 A few years later a garden club friend, Vicki, passed along a large quantity of her volunteers. 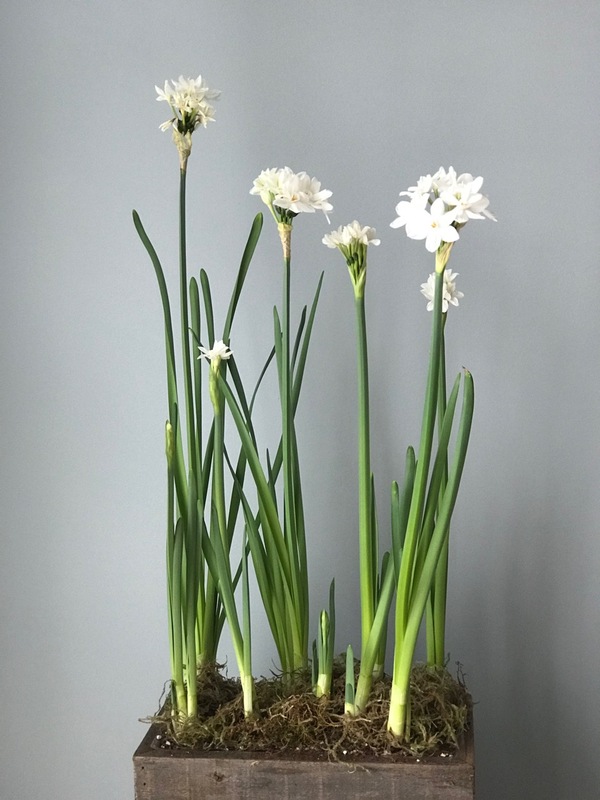 They took about 3 years before flowering, well worth the wait. 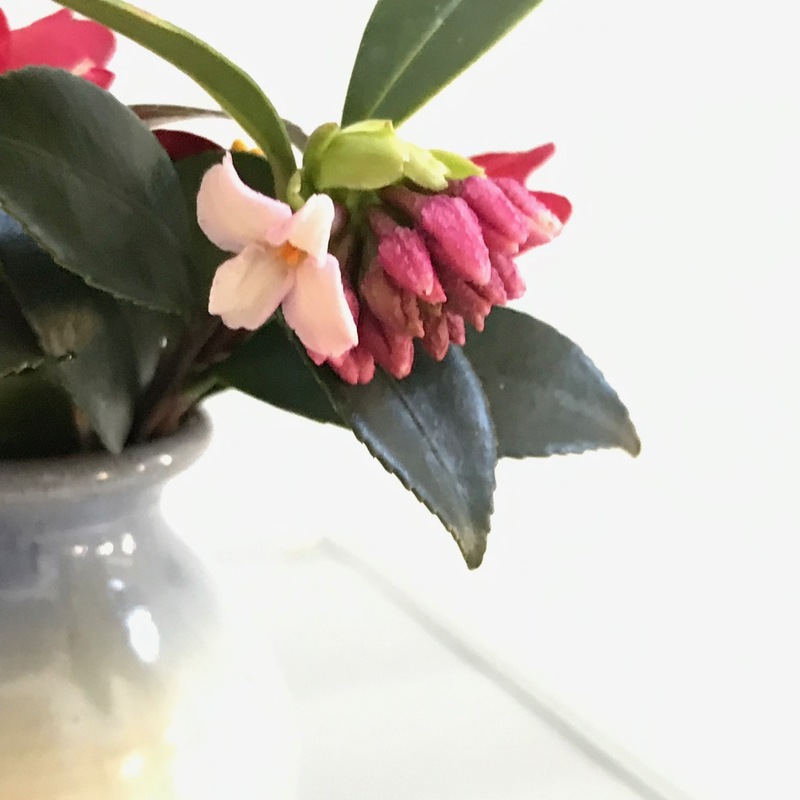 Several tiny flowers of Daphne odora burst open this year on January 12. 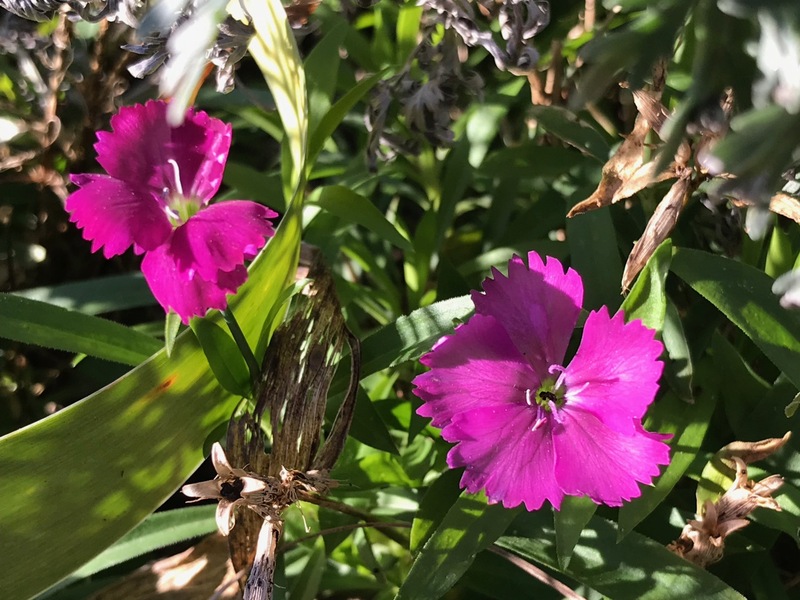 Very few have opened since then but warmer weather this week may encourage them. 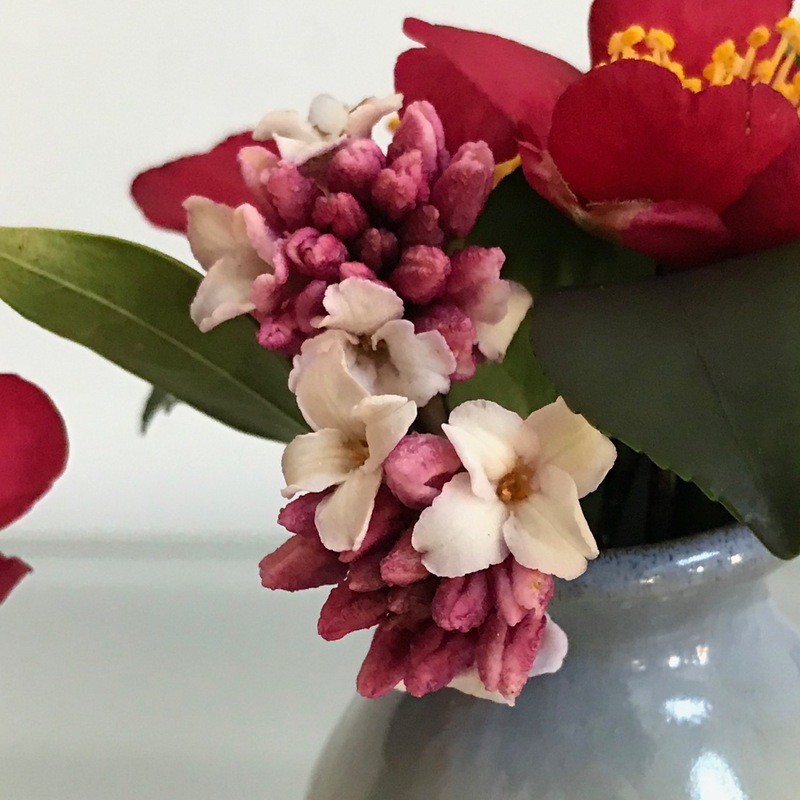 These fragrant shrubs usually peak late February-early March. 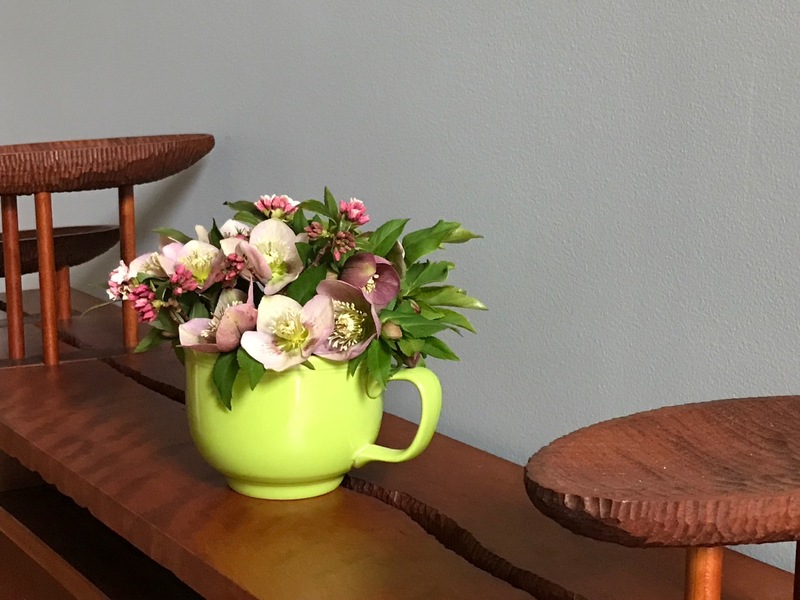 While Daphne is long-lasting in a vase, the hellebores’ beauty is fleeting. 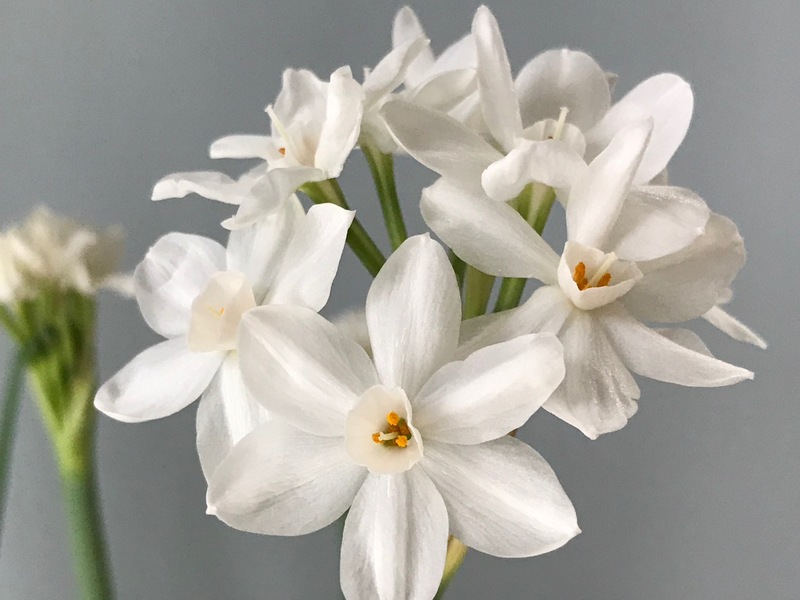 I chose not to singe the stems or try other methods to preserve them. 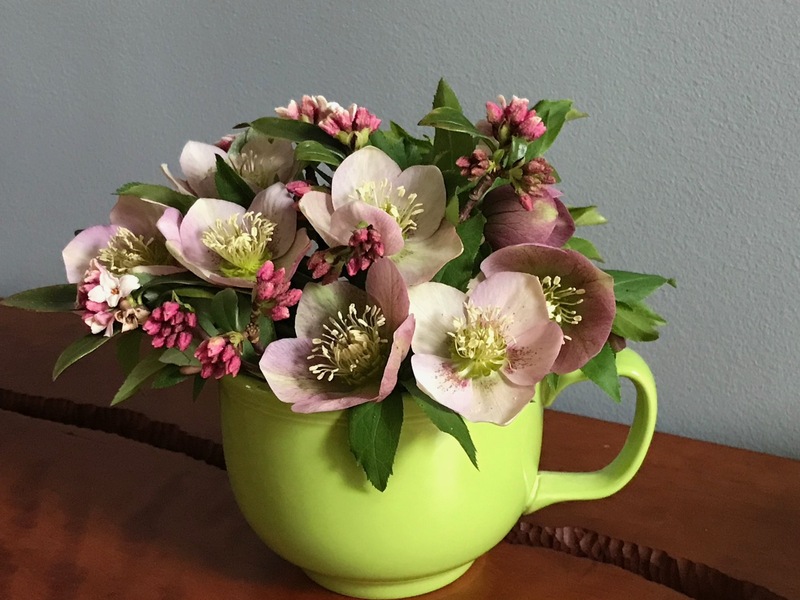 Left with quite a few extras after finishing the Ikebana, I tucked the remainders into a lime green soup mug. 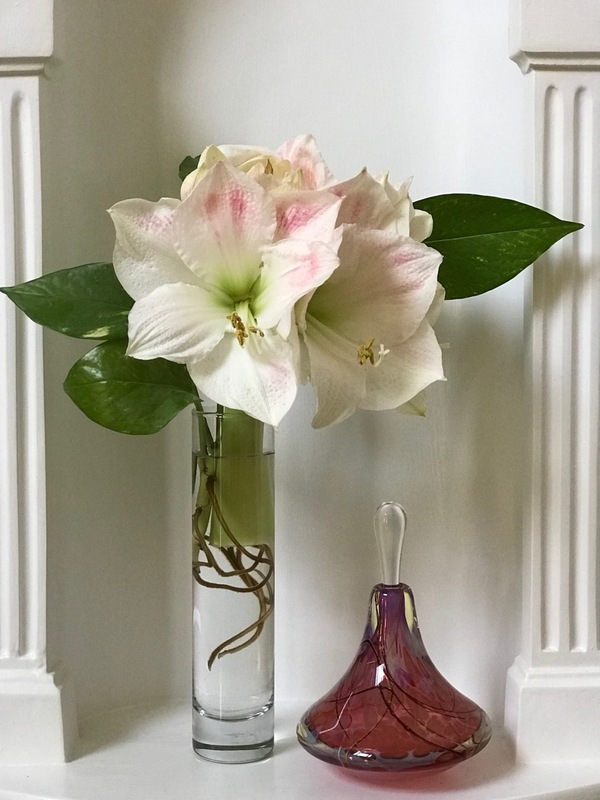 I liked their cheerful spirit so much I decided to share both designs today. 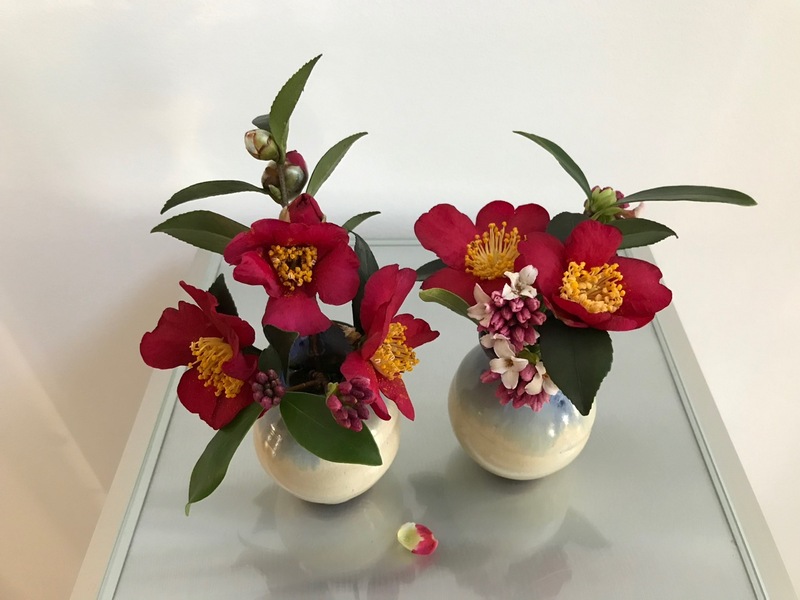 This entry was posted in garden and tagged 2019vase, Camellia sasanqua 'Yuletide', Daphne odora (Winter daphne), flower design, Helleborus x hybridus (Lenten rose), ikebana, in a vase on monday on February 4, 2019 by pbmgarden. 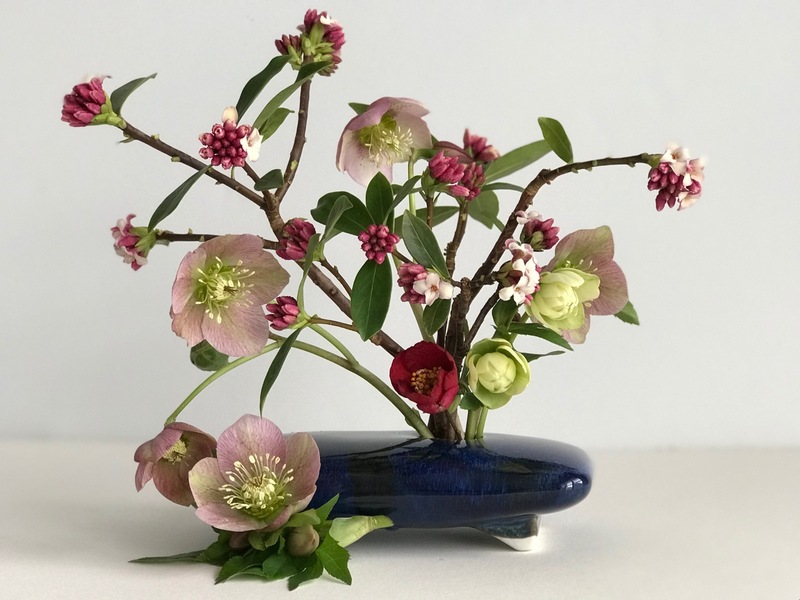 Each Monday from Rambling In The Garden Cathy invites us to share a vase assembled from materials collected in our gardens. 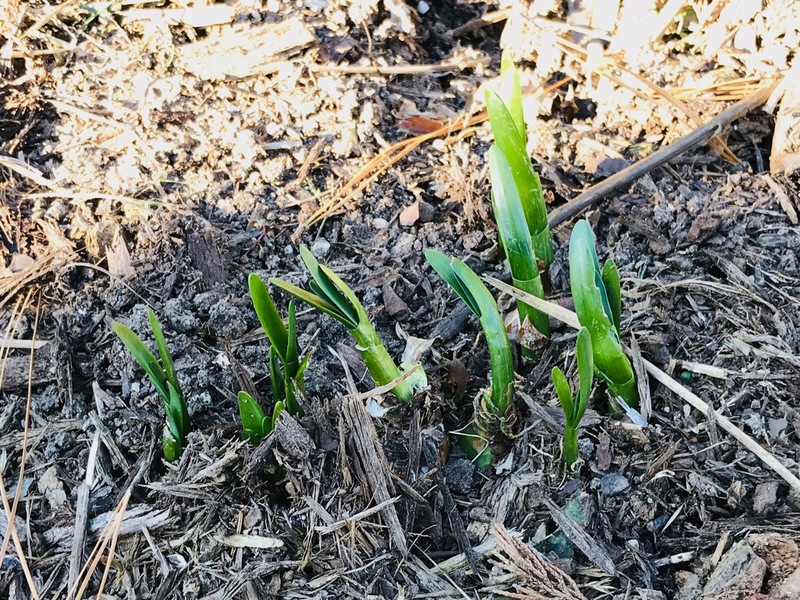 Ahead of last night’s plunging temperatures (17°F. 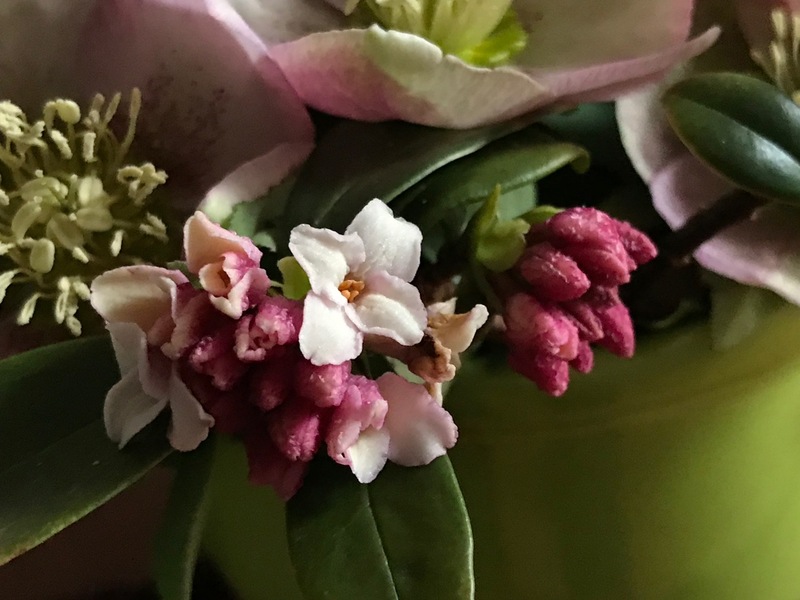 ), I collected some of the last camellia blossoms along with the season’s first deliciously fragrant Winter Daphne. 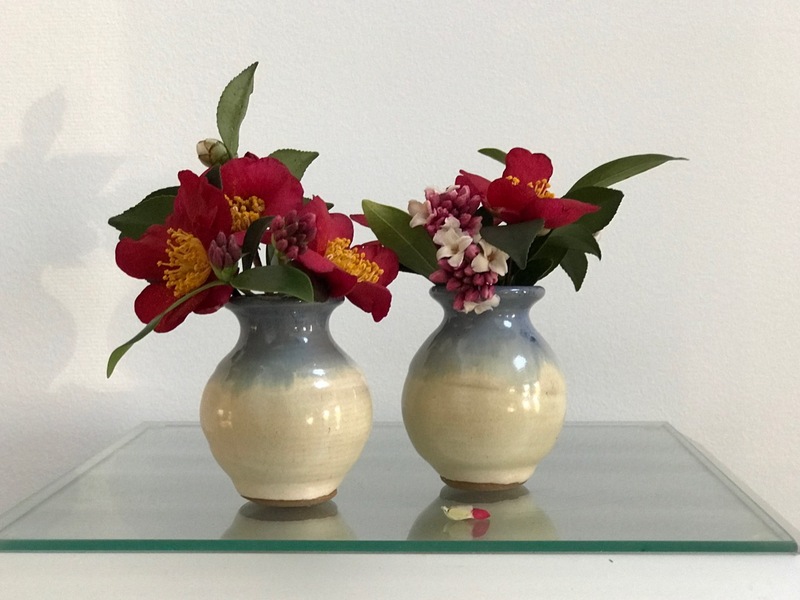 An exquisite pair of small cream and blue-gray vases were the inspiration to rejoin Cathy today after a few weeks’ absence. 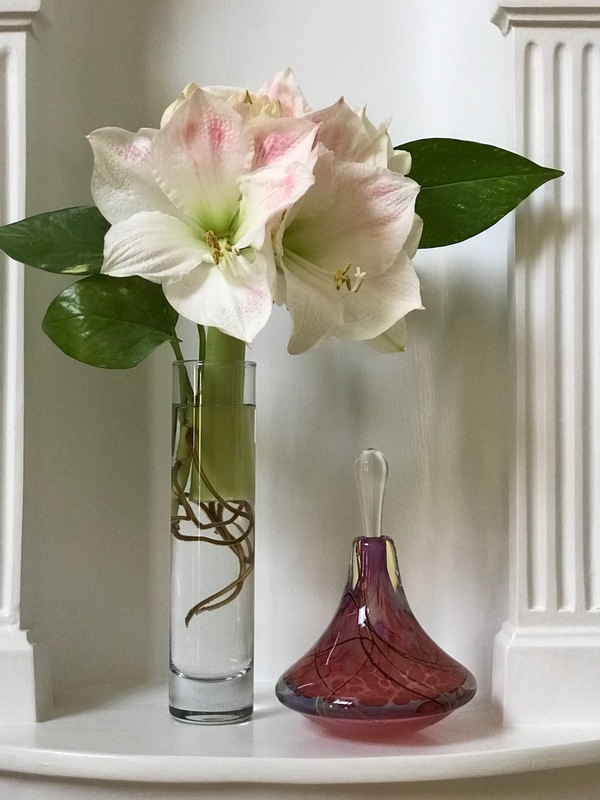 Our daughter Meghan is visiting this week from Los Angeles and at a large family gathering Saturday her cousin Julie gave her these ceramic vases, thoughtfully sized so they can easily fit into her suitcase for the return trip. 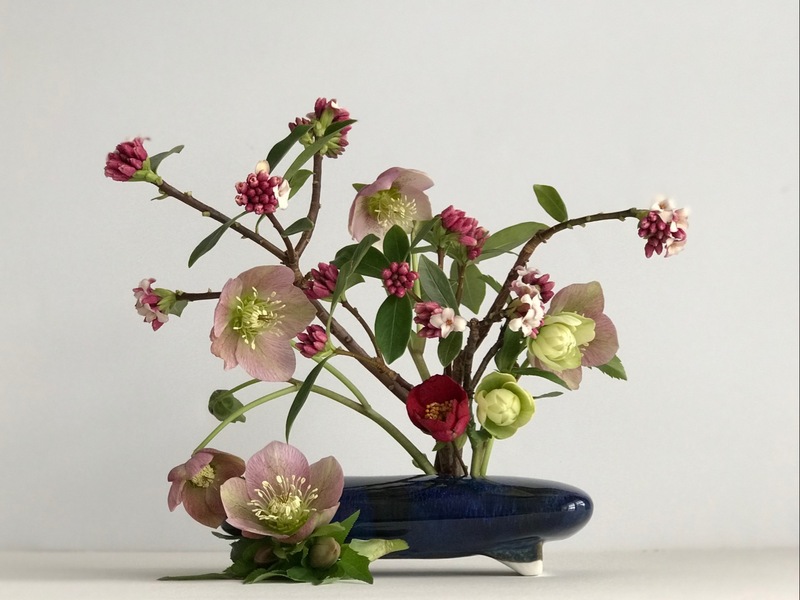 The artist is Julie’s mother-in-law, which makes them even more special. 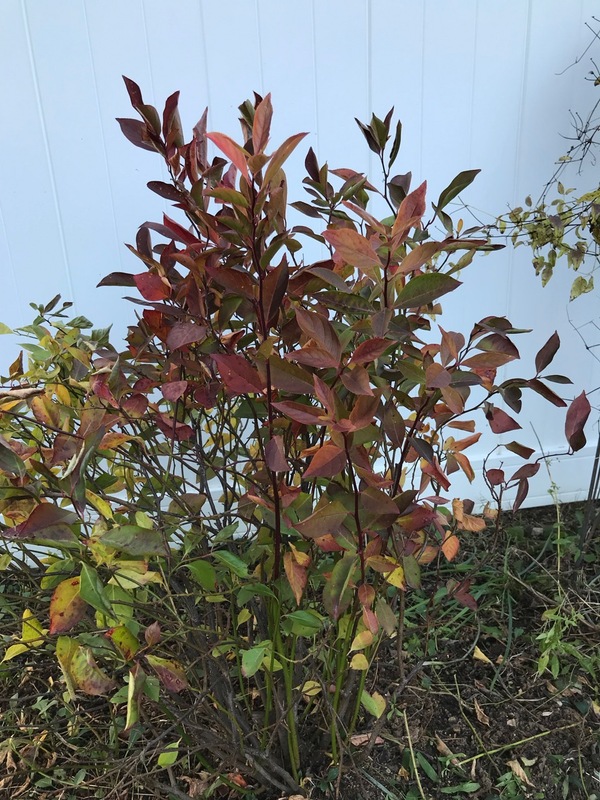 Since mid-December my husband has had some health issues that required our full attention and energy. 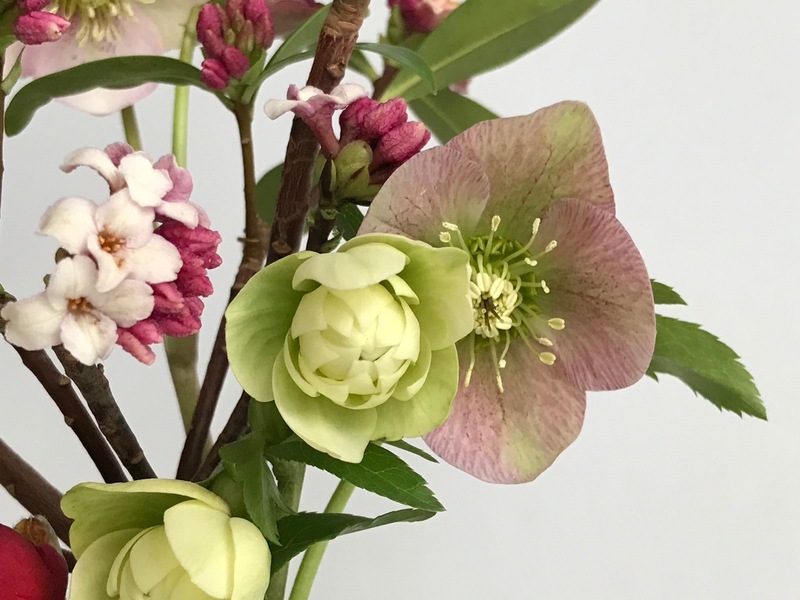 As things are settling down I hope to find more time to post. 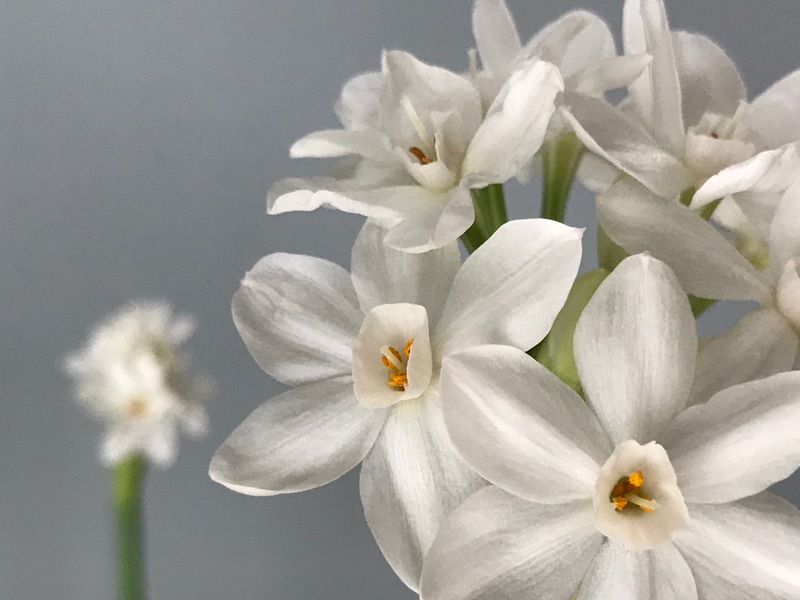 Meanwhile I belatedly wish you happiness, peace and flowers in 2019. 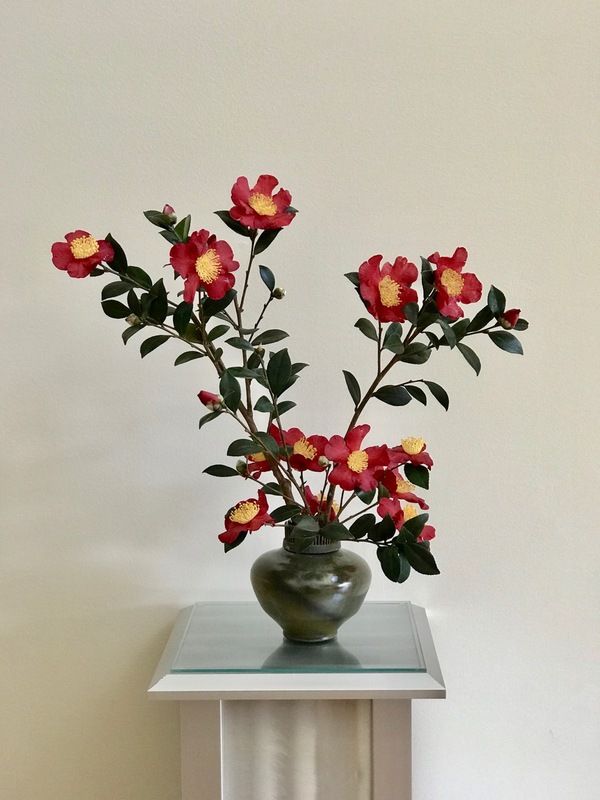 This entry was posted in garden and tagged 2019vase, Camellia sasanqua 'Yuletide', Daphne odora (Winter daphne), flower design, in a vase on monday on January 21, 2019 by pbmgarden. 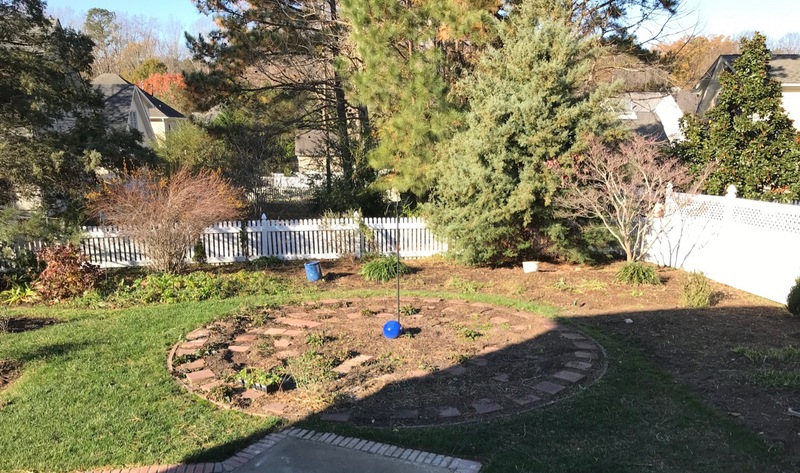 My garden club visited a member’s greenhouse during the first week of December. 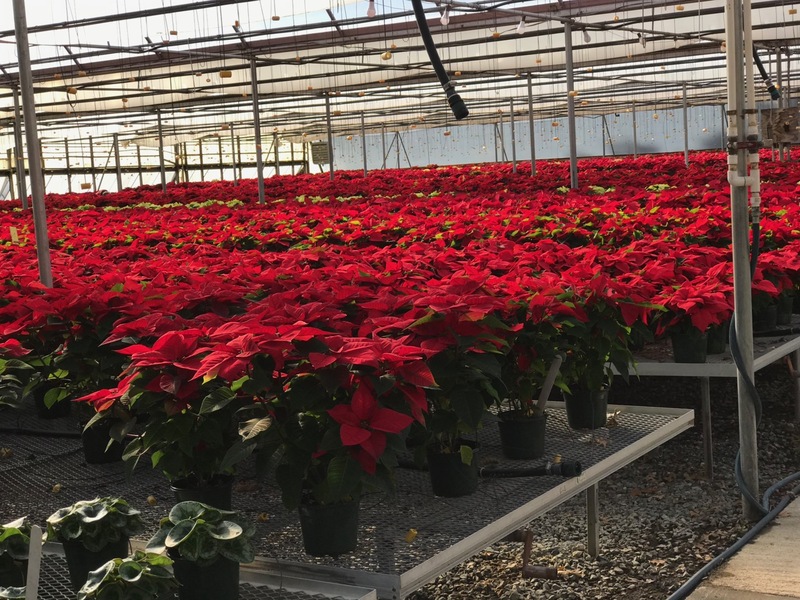 Although Katydid Greenhouses displayed a multitude of poinsettias, cyclamen are what I prefer for decorating with during the holidays. 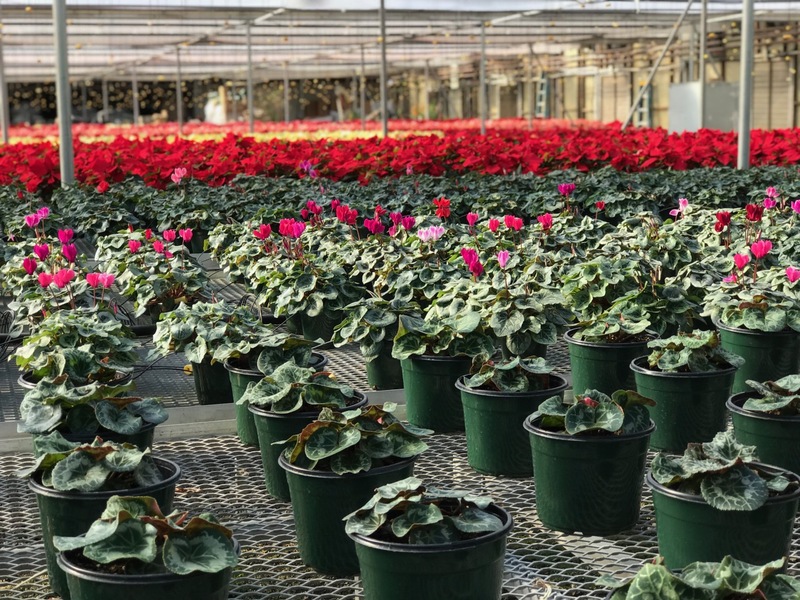 Fortunately there were plenty of cyclamen in varying colors from which to choose. 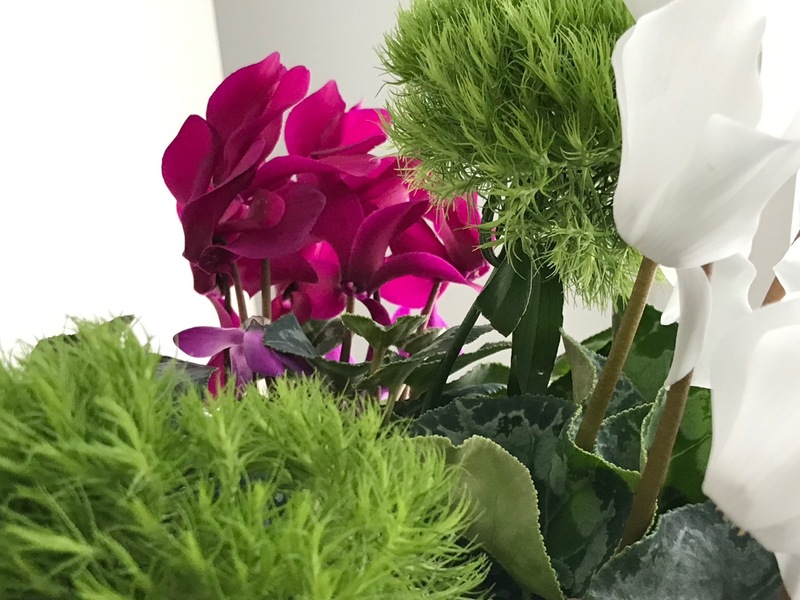 For today’s offering I combined four cyclamen from that field trip with a few Green Trick Dianthus that caught my eye at the local grocery. 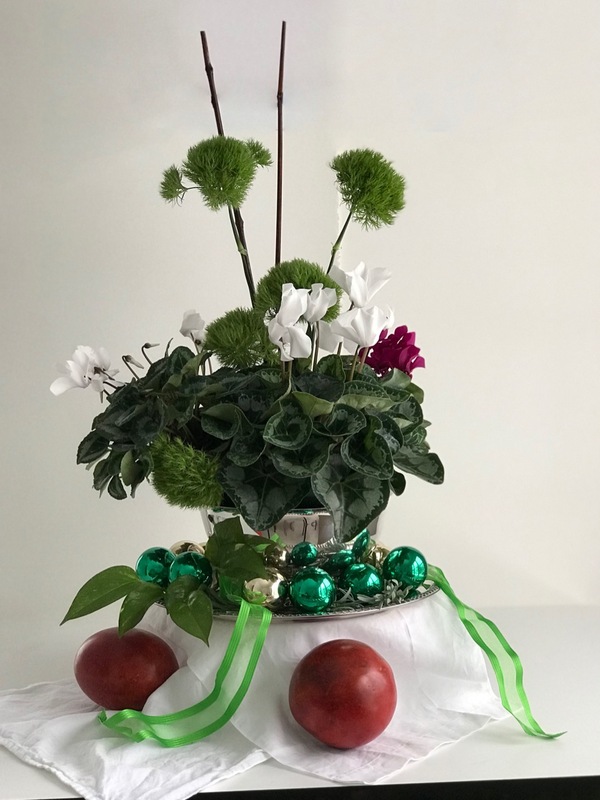 I finished the arrangement with a few decorative baubles—red seedpods, glass ornaments and ribbons. 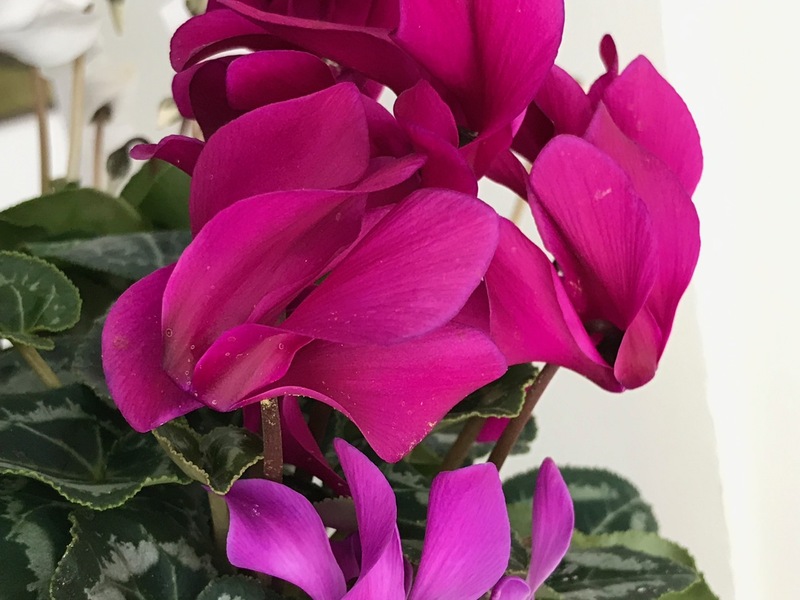 White cyclamen are my favorite but this dark pink was too appealing to leave behind. 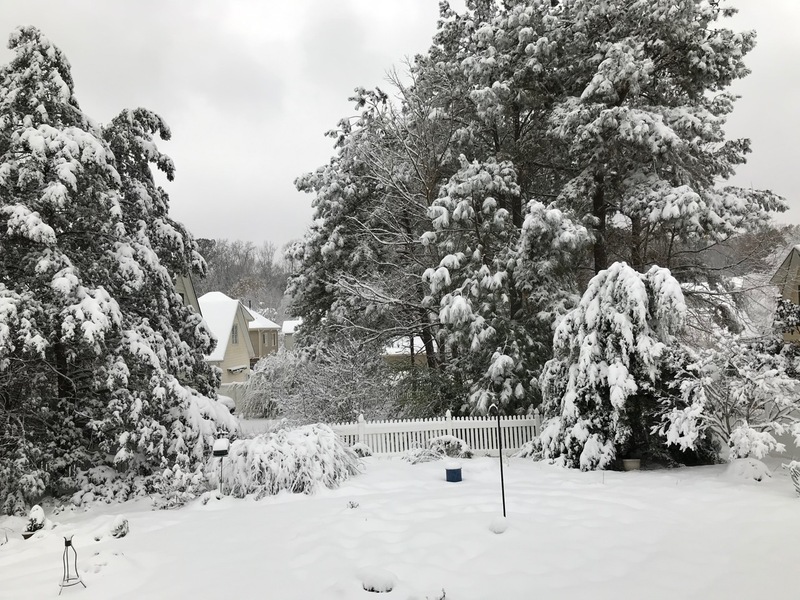 Yesterday’s view of the meditation circle and garden was a snowy winter wonderland. 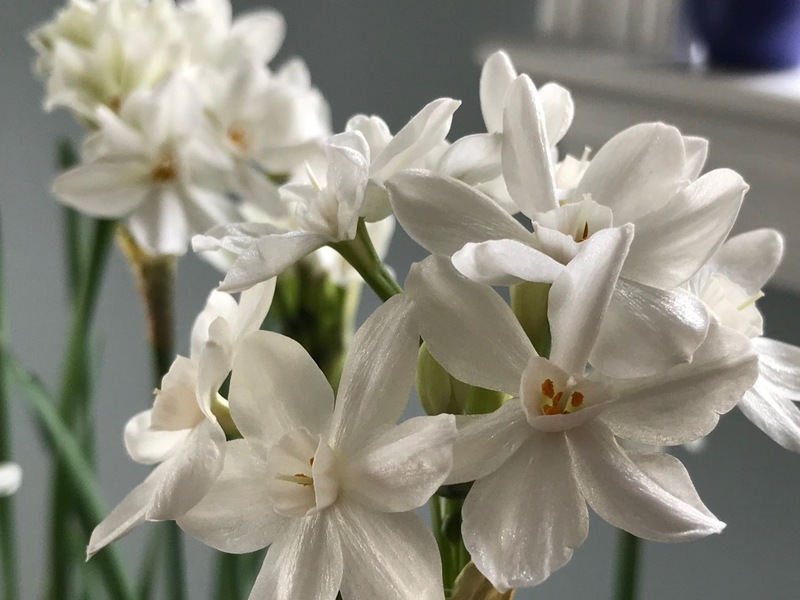 Fortunately I managed to get all my bulbs planted early in the week. 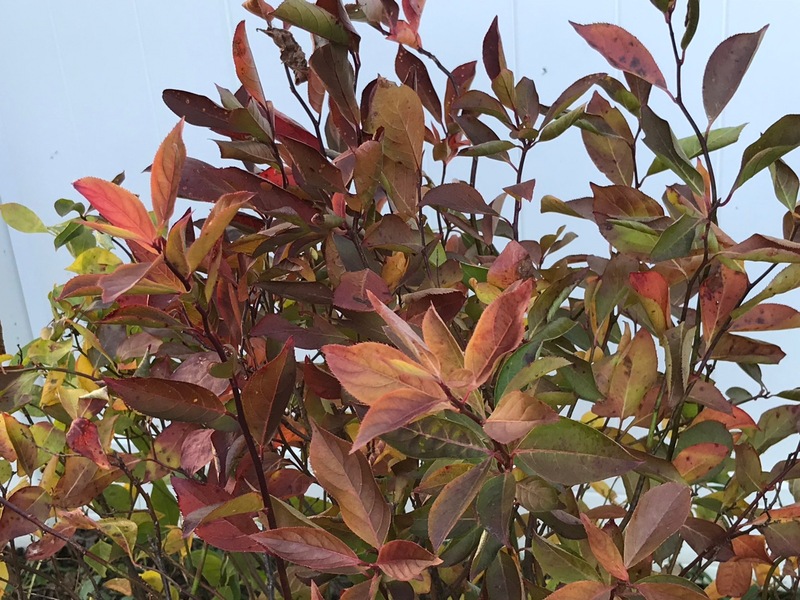 I hope they’re settled in and enjoying a nice chill. 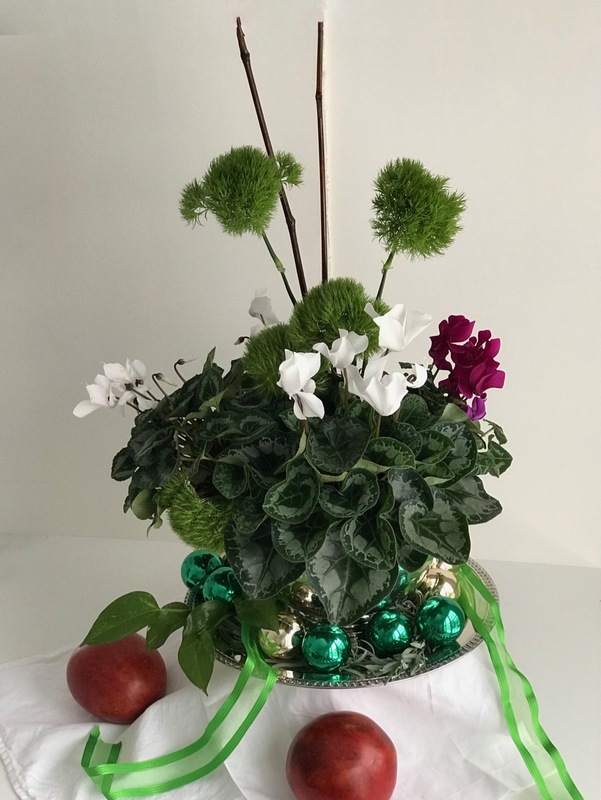 This entry was posted in garden and tagged 2018vase, cyclamen, green trick dianthus, in a vase on monday, winter garden on December 10, 2018 by pbmgarden. 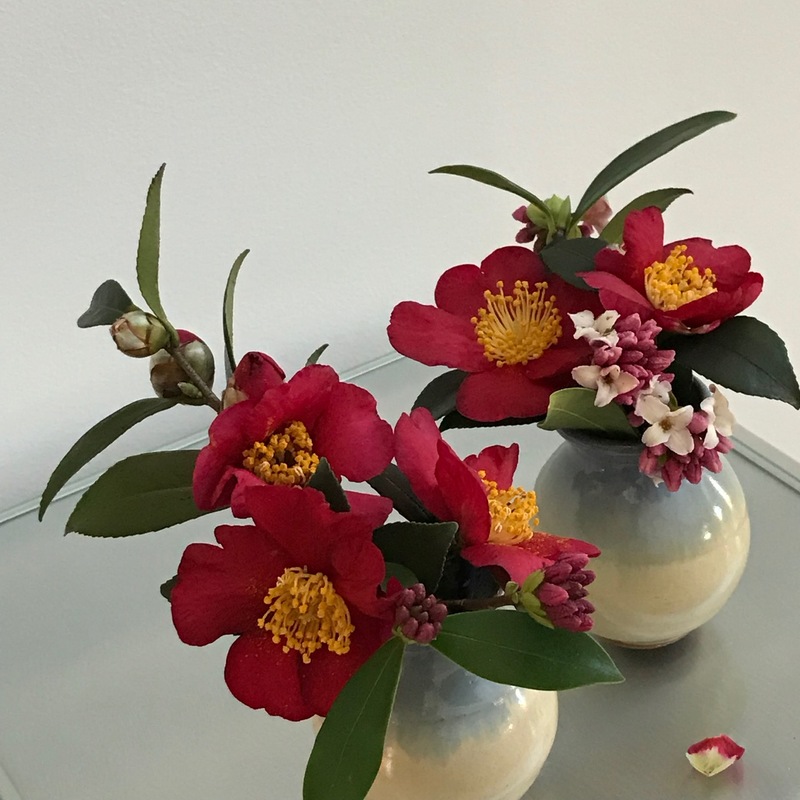 Today I offer edited and arranged branches of Camellia sasanqua ‘Yuletide’ in an artichoke green vase. 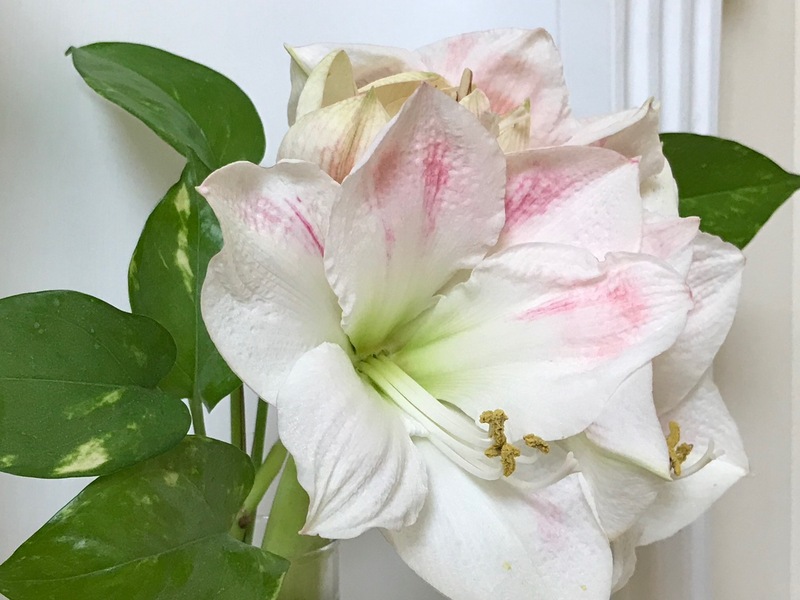 The blooms are not fully open and will continue to unfold. 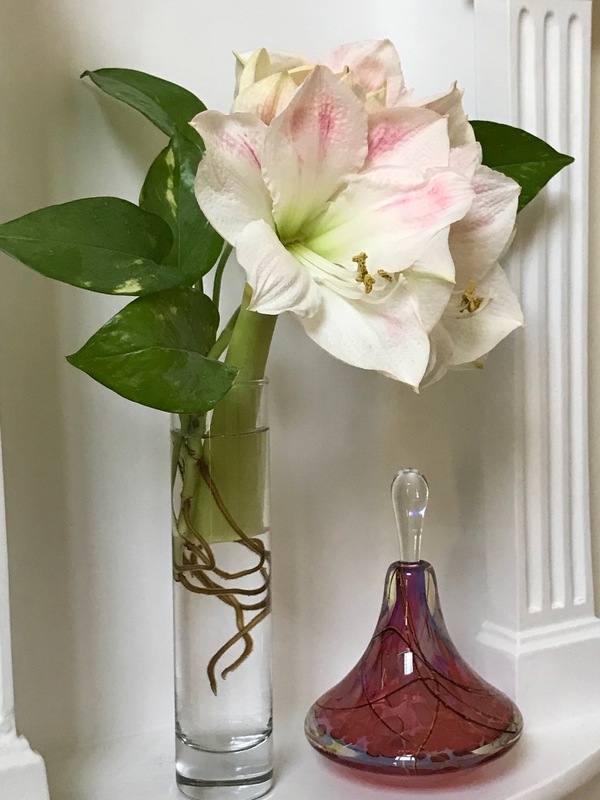 Quick report back on the Hippeastrum from last week’s vase: the stem was cut 9 days ago and placed in water. 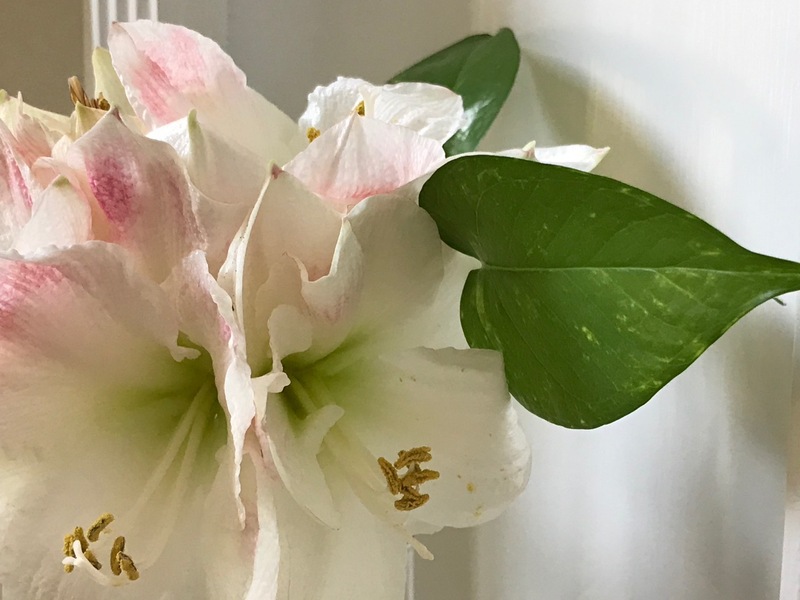 While two flowers have faded and been removed, the remaining three blooms continue to look fresh. 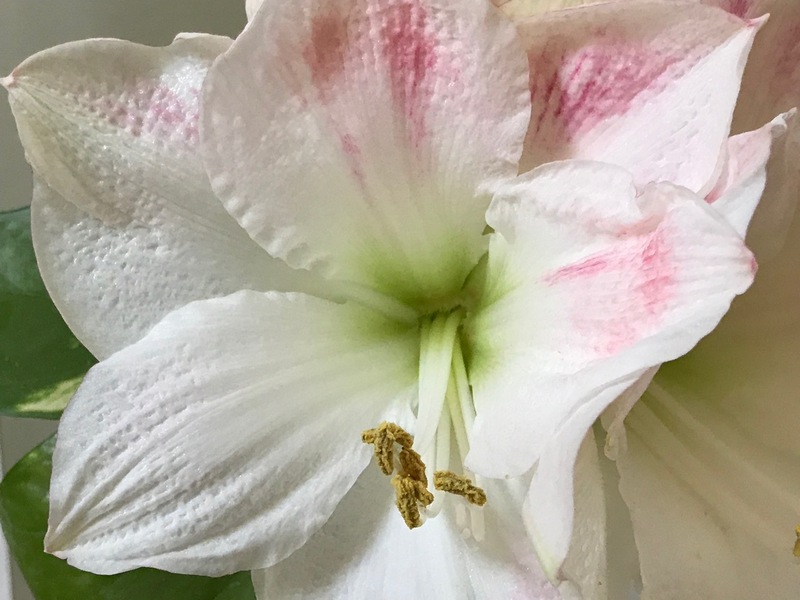 Four of the flowers had been open for a few days before I cut the stem, so I am satisfied with the longevity of the amaryllis as a cut flower. 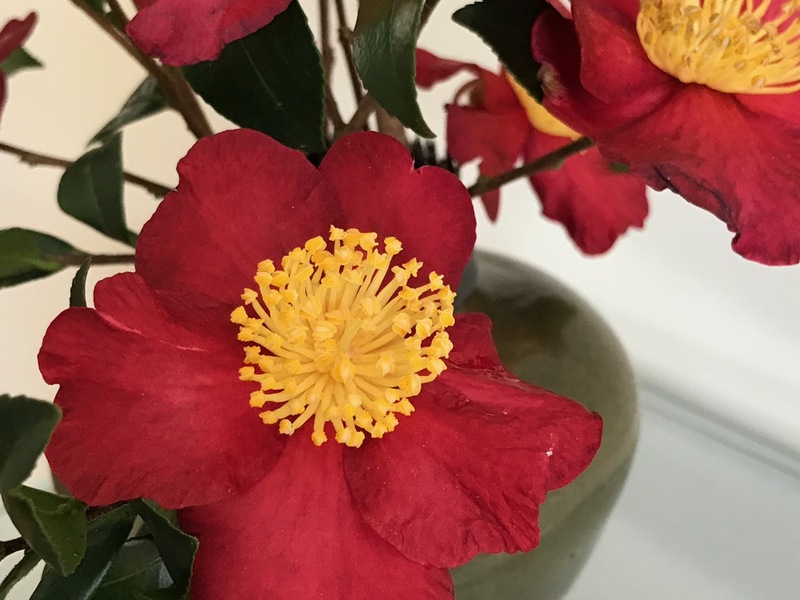 This entry was posted in garden and tagged 2018, 2018vase, Camellia sasanqua 'Yuletide', in a vase on monday on December 3, 2018 by pbmgarden.